The Sony Xperia Z5 is now available in Nepal at the price of NPR 80,000. The smartphone offers really high end performance with a stylish look. The Sony Xperia Z5 comes with a display screen of 5.2 inches with a resolution of 1080 x 1920 pixels (~428 ppi pixel density). The sharpness and vividness of the colors on this phone are very good giving a triluminos display. The screen is protected with a scratch resistant glass and has oleophobic coating on it. Talking about its processing, the Sony Xperia Z5 uses a quad-core 1.5 GHz Cortex-A53 and a quad-core 2 GHz Cortex-A57 as its CPUs alongside a RAM of 3 GB. The chipset used is a Qualcomm MSM8994 Snapdragon 810 making the processing speed swift enough for normal navigation as well as for playing high-end games. Also, the smartphone has a memory of 32 GB which can be expanded up to 200 GB and it operates on an Android OS i.e. v5.1.1 (Lollipop). Furthermore, the smartphone is equipped with a 23 MP primary camera with phase detection auto focus and LED flash and a 5.1 MP secondary camera with HDR. Sony is quite reputed for its photography features and the device has lived up to its name with additional features like geo-tagging, touch focus, face detection, HDR, panorama, etc. Furthermore, it can record videos of 2160p@30 fps. Lastly, the dual-SIM smartphone is powered by a non-removable Li-Ion 2900 mAh battery that can give a standby time of upto 540 hours on 3G. 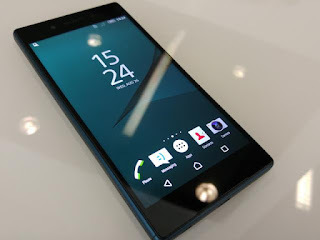 So what do you think about this smartphone from Sony? Do let us know in the comment section below and don't forget to check out the Sony Xperia Z3.